Konosuke Matsushita kept saying, “We produce people, and we also produce electrical goods." He always believed that the measure of a company was the people who worked for it, that no enterprise could succeed if its employees did not grow as human beings, and that business, first and foremost, was about cultivating human potential. No matter how much capital, technology or equipment an enterprise boasts, it is bound to fail if its human resources are not developed. And Matsushita did not mean merely improving employees' technical know-how, management, or sales skills, though these are certainly part of the concept. For him, the true aim of personnel development was to cultivate individual self-reliance and responsibility, to guide employees to an understanding of the value and significance of their own work and of the obligation of the company to contribute to society. 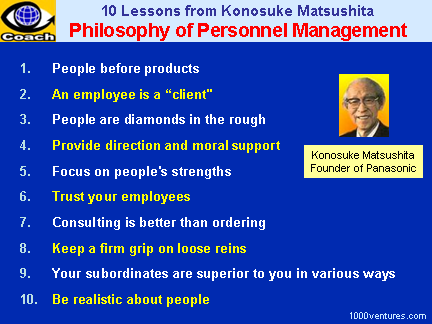 An Employee Is a "Client"
Right from the very early days of the company, Konosuke Matsushita put immense effort into personnel training and development. "However much you rub it," he reflected later, "you can't make a diamond from an ordinary stone. But if you have a diamond in the rough, you can draw out its gleam with careful polishing. And depending on how you polish it and cut it, you can make it sparkle and shine in various different ways. People are just like uncut diamonds; they each have the potential for various kinds of brilliance, qualities which, if polished right, will shine radiantly. It is very important for personnel managers to have a proper grasp of this concept, and to attempt to draw out the special strengths of each employee." Konosuke Matsushita used to say that, as a manager, focusing on people's shortcomings quickly gave him a headache. When you only look at weaknesses, every person you encounter appears inadequate in one way or another, and you end up vacillating about assigning anyone to the job or task you have at hand. Subordinates, too, are bound to be unhappy if all you ever notice is their failings. "I always tried," Matsushita said, "to notice people's strong points seven times out of 10 and their weaknesses the remaining three." By paying more attention to employees' strengths, he believed, he would be more likely to think of ways to put those strengths to good use. The important thing is to keep your assessment of others' strengths and weaknesses in proper proportion. Though Matsushita easily delegated work and authority to others, he did not thereby abdicate responsibility for what was going on under him. He expected to receive reports about projects at appropriate intervals.